* Humidity: 10 to 95 % RH, Temp. ( oC/ oF) . * Anemometer: 0.4 to 30 m/ s, Temp. ( oC/ oF) . 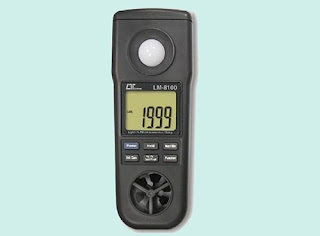 * Light : auto range, 0 to 20, 000 Lux, 0 to 1, 860 Ft-cd. * Type K Thermometer: -100 to 1300 oC, oC/ oF. * Data hold, Record ( Max., Min.) . * Optional type K Temp. probe: TP-01, TP-02A, TP-03, TP-04.